This is my tribute to a great friend who I was fortunate to know through most of our adult lives. More than that, he was one friend that commanded my attention when I needed some advice or support. I’m certain many reading had a similar relationship with him. He was always non-judgmental, understanding, and best of all, completely frank. With that preface these few words will be, at best, a feeble attempt to capture the real Tom I knew and loved. Our mutual friend, the late Mallory Horne, once told me if you don’t like sometimes blunt, sometimes carefully chosen words that you don’t want to hear, don’t ask Tom’s advice. That is what you will get. I found that to be true but I also found he was never demeaning or super critical but advice was given with uncanny understanding and respect and most often the correct, ethical, and honor-able course you could take. Tom Barkdull was a person who was graced with uncommon common sense. This allowed him to quickly reach the right decisions, without frills or editorial restriction. Common sense also allowed him to see things with clarity and with the ability to find the right path in his personal life and also in the practice of law, his first and last intellectual love. He brought that to the bench. He was quickly an expert equal to any “specialist” lawyer that appeared before him. This was quite unexpected on the part of such a lawyer and that quickly punctured any facade of superiority, if one existed. Before his judicial career he was practicing law that was rooted in the continuing post-World War II growth and vitality of Miami and Florida. Tom was sought out for all kinds of large cases and transactions. As a young lawyer he was relied on by many of his seniors. He instilled fierce loyalty in his clients. Tom never forgot those who gave him his opportunity, particularly the great Marion Sibley. Those of you who knew Tom knew he loved great seafood. We teased him about that and when accused about representing some of the premier restaurants on Miami Beach, and despite his normal inexpensive eating habits, he received favorable prices which he assumed everybody else paid. One of my great memories was going to an unpretentious seafood restaurant every Monday in Wakulla County with Tom and Mallory Horne. We told many stories. It was a treat to be with two icons of Florida history: Tom, the great judge. And Mallory, the most influential person to serve in the Florida Legislature. As everyone reading knows, for 30-plus years he served and led the Third District Court of Appeal in suggesting changes as to how it operated. Primarily because of his efforts, the Third District was considered the most efficient and most reliable of our appellate courts. The other appellate courts adopted many of the practices which this Court established. 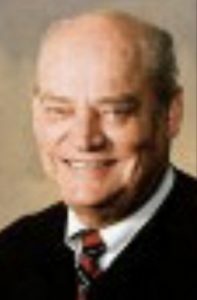 Tom really respected Judge Schwartz and often referred to him in his deferential norm as the brains of the court – I told him he should be careful doing that because Judge Schwartz might believe it. He assured me he already did! Tom was the only person who was a member of all three Constitutional Revision Commissions. In 1998 he was appointed by the Governor. I served with him on the 1978 Commission when he was an appointee of the Chief Justice. On the 1998 Commission, which I chaired, he was the Commission’s most knowledgeable member. It was on his advice and by his influence that the rules were crafted and the key to success, as it turned out, was he and I working together, succeeding in a required 3/5 vote to place anything on the ballot. We knew at least one set of appointees were controlled by the House which made it clear this was going to be a partisan fight as far as they were concerned. The Senate members, appointed by Senator Jennings, were given the same free rein to vote their conscience as the three judicial appointments and the Governor’s appointees were given. The actual political party breakdown gave a one-vote margin to the combined democrats, the nonpartisan judges, and the Attorney General, a member by designation in the Constitution. The nine House appointees were instructed how to vote on many issues. The Senate appointees were given instruction to vote their conscience. As Rules Chair and with a painful memory of the failed 1978 Commission Tom Barkdull, with my cooperation, proposed a rule that would require twenty-two yes votes to put anything on the ballot – this created a non-partisan result. I can testify that many members worked very hard to produce a sound revision, none harder than Tom Barkdull. Without his experience, respected and completely informed service, it would have been a forerunner of the present party-line voting which has stymied the U.s. government and eliminated a true balance of powers between the three branches of government. We must take all of our remembrances and walk away today. He loved this place, the Third District Court, almost as much as he loved the Keys and his life-long pleasures fishing those waters. Another area of importance that he helped establish that beneficially improved our system of justice was the Judicial Qualifications Commission. I represented a judge in a high level trial in which the JQC, led by Tom’s reasoning, decided the judge should be removed from the bench. In an appeal to the Supreme Court my client was fortunate and he was given a reprimand by the Court. I must say it was not my brilliance that achieved that result, it was the difference of philosophy of a majority of the Court to that of Judge Barkdull and his fellow members of the JQC. As he said in one of our last conversations, he was glad to be back home and to the Keys where his father and grandfather taught him to fish. He passionately loved fishing there with his son and grandchildren. He hoped they love it as much as he did and will pass that on to their progeny. To that end his ashes were committed to those lovely waters where he was most happy.